Stress is something we all experience. Good stress, bad stress and chronic stress, which is where things start to fall apart. When under stress for a long period of time your body starts to experience symptoms such as fatigue, headaches, pain, tension, digestive problems, skin problems and more. Acupuncture can have a positive effect on all of these symptoms by treating the underlying root cause; stress. Acupuncture and acupressure help to relax the body and calm the mind, both of which relieve stress. Acupuncture stimulates the parasympathetic part of your nervous system (rest & digest) and calms your sympathetic nervous system (fight or flight). Sometimes your body gets stuck in a sympathetic/ fight or flight mode and needs something to break the cycle, like acupuncture. At Remedy Wellness Centre we also offer workshops for stress and anxiety where you can learn about meditation and other healthy practices to help manage stress. Pericardium 6 or Inner Pass Acupuncture Point is used by acupuncturists to relief stress. It is one of the most well-known, highly researched and often utilized Acupuncture points for stress. It is indicated to calm the spirit and regulate the heart, making it useful for conditions like heart pain, palpitations, hypertension, insomnia, fear, mania, nausea and menstrual irregularities to name a few. How can one little point benefit so many vastly different conditions? Because it works to treat the underlying cause and common denominator of most illnesses: stress. Recent studies are proving that PC6 stimulation has powerful effects in the body - acting to relieve stress, as well as to repair the damage stress has already caused. It is also a well-known acupressure point for nausea. This action has been utilized by the development of wristbands that stimulate the point to treat motion sickness. 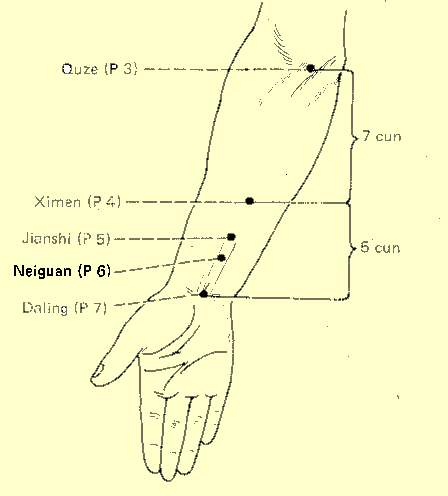 PC6 is located on the inner forearm, 2 cun distal from the crease of the wrist. Cun are the measurements used by acupuncturists to locate points on the body. Its measure is unique to each individual's anatomical structure, to compensate for differences in body types. 1 cun is approximately the width of the individual's thumb.